Are Federer's rivals pretenders to the throne? The tennis season is nearly four months old and little appears to have changed in the established order at the top of the men's game. 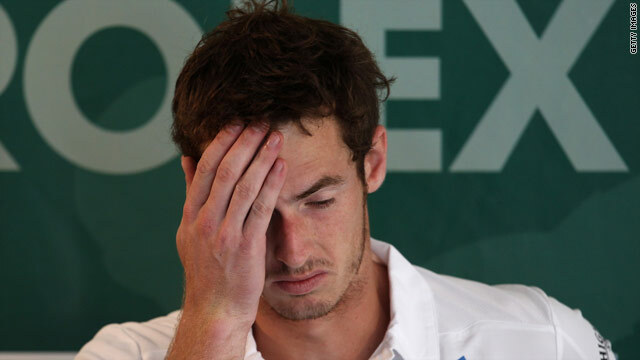 Murray cut a forlorn figure after his defeat at the Monte Carlo Masters. Roger Federer won the first grand slam of the season with a straight sets victory over Andy Murray, while Rafael Nadal is slowly working his way back to his best form and watch for him on the clay at Roland Garros. But this was supposed to be the year when one of the young pretenders such as Murray, Juan Martin Del Potro and Novak Djokovic finally stepped up to the plate and ushered in a new era of dominance. Murray's recent disastrous form is the most perplexing, crashing out in the quarters at Indian Wells, losing his Miami Masters crown, followed by a disastrous opening match defeat at the Monte Carlo Masters, three straight losses, his worst run since 2006. The Scot, refreshingly honest, described his loss to Philipp Kohlschreiber as "rubbish" but instead of moving up the rankings he is going in the opposite direction. While doubts remain over several aspects of Murray's game, noticeably his second serve, the same could be said about Djokovic, who told CNN's Open Court that he wanted to be world number one then promptly lost early at Indian Wells and Miami. A successful defense of his Dubai Open crown is a slim return in 2010 to date and the popular Serbian has reacted by parting company with one of his coaches, Todd Martin, who was reportedly hired to remodel his service. By a quirk of the rankings, Djokovic has risen to world number two, but has failed to add to his sole grand slam triumph at the Australian Open in 2008 after which he promised to sweep all before him. To be fair to Del Potro, the lanky Argentine has been troubled by a wrist injury, but it could not be used as an excuse for his quarterfinal defeat to Marin Cilic at the Australian Open. Having inflicted a rare grand slam final reverse on Roger Federer at the U.S. Open last September, the force appeared to be with him, but like all the challengers to the Swiss maestro, their efforts have petered out. Even Nadal, who reduced Fed to tears of frustration on his way to a hat-trick of grand slams in 2008, has been halted in his tracks by nasty knee injuries which reduced him to a pale shadow of his former self. Which leaves Federer, who now seems to care little about tournaments outside the grand slams, but reserves his best for when it really matters, like the semifinals and finals of this year's Australian Open. With 16 grand slams and counting, he could afford to rest on his laurels, but while his challengers offer such an inconsistent threat the 28-year-old is making hay while the sun still shines. It's just a pity that Murray and Djokovic in particular seem incapable of matching their incredible talent with grand slams while the likes of Andy Roddick have been scarred by too many defeats at the hands of super-Fed. Sounds like another Federer super fan if you ask me. Give me a break. correction. nadal did not have a hat trick of grand slams in 2008. he only had 2 that year, the french & wimbledon. if you add 2009 australian, then that makes it a hat trick for 2008-09. Well, it seems again like it's Nadal's job to put out Federer of his comfort zone. If anyone can do it this year, then it's him. I just hope for some real rivalry for top rankings. Nadal has shown great form in past few tournaments, but only winning against top 5 players can shush all the critiques. I have faith in Juan Martin Del Potro. He is solid & will definitely be the next big thing in tennis. Only if he can work on his fitness and get himself less injured. Nadal is in incredible form now , despite injuries at the Aussie open , he is definitely a formidable threat to federer in all grandslams...and a favourite in the French... I Do admire Federer's technique one of the reasons he hardly gets any injury! Need not to worry too much Rafa is gradually regainning his usual form,just be patient. With all due respect to your opinon, I think that players who have seen the same guy remain number one for the last few years without being able to take his place are pretenders by definition. Only Nadal had a shot at the number one spot and couldn't sustain it. He looks in very good shape these days, which makes him the main favorite for Roland Garros. Federer won that GS for the first time last year, so I guess that makes Nadal a pretender this time around. after his trying times. I see him as a winner on clay for years to come. There is no doubt now (after Madrid's final) that Roger's number one spot could be seriously threaten by Nadal this summer. The time again has come. Federer has it all but with the recent Nadal wins in Monaco, Rome and Madrid he is already firm #2 and challanging Federer for the #1 spot. Nadal is not playing like a 'pretender'. He is serious threat. I believe that Nadal will win two of the three remaining grand slams (of the year). Federer looks tired. I believe he will retire at the end of this season. I hope he wins Wimbledon or the US Open. Nadal has all to win in Paris. Both, Nadal and Federer are excellent players, good role models for junior tennis players. The Madrid final was very competitive. Nadal won 85 of 169 points played. Federer won 84. That close. I wish both the best, no injuries and that we, as tennis fans, have the opportunity to see them play again. A GS final will be great!!! Well, the questions have been answered for this year, after last night's U.S. Open – Rafa Rules!